The 'Boddington Arch' at the entrance to The Carrs on Chancel Lane tells us that the land was given to the people of Wilmslow for their enjoyment by Henry Boddington in 1925 so in 2010 it seems we are celebrating 85 years of the land in public ownership. But is this really true? The history of the Carrs (Norse for 'a bog') is in fact far more complex and the area we know today as The Carrs did not actually come into being until many years later. Originally, and with the exception of an area around the Parish Hall held as glebe land by the Rector of St Bartholomew’s church, much of the land currently comprising The Carrs formed part of the Pownall Hall estate owned by Lord Stamford until he sold up in the years 1841-1859. After a succession of owners, Henry Boddington, of brewery fame, acquired the property and from that time the development of the area as a public open space began. Henry Boddington knew that the area was a 'a favorite resort with local residents' and had been in discussion with Wilmslow Urban District Council (WUDC) in 1925 regarding a grant of the land for public enjoyment. Sadly, and despite the inscription on the entrance arch, he died in the September of that year before any agreement was reached. It was left to his widow to carry out Henry Boddington’s wishes the following year although it was not until 1930 that the official handover of 'The Boddington Playing Fields' was completed. 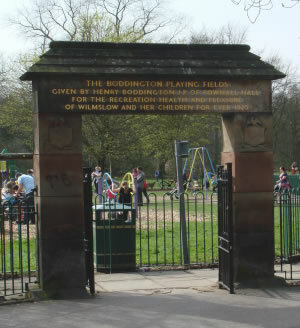 At that time the council paid the princely sum of £62.10s (£62.50) for the entrance gate now commonly known as the Boddington Arch with its inscription that reads 'Given by Henry Boddington JP of Pownall Hall for the recreation health and pleasure of Wilmslow and her children for ever 1925'. At the time of his death, Henry Boddinton was also negotiating with WUDC for the transfer of the area of land known as The Carrs to the Council. Again, however, this was left to his widow to complete and it was not until 1935 that the Council’s records show that completion of the transfer of land between the old Hawthorn Hall/Pownall Hall boundary (roughly a line from the river up to Hawthorn Lane at the point where it becomes Broad Walk) and Pownall Bridge was made. At about this time, land from Pownall Park was also being sold off for housing almost to the front of the Hall. In 1932, the land between Pownall Hall and Twinnies Bridge (the area at the far western end of The Carrs behind the current toilet block) was given by Ernest Greg of Norcliffe Hall, Styal whose death followed just two years later. The next piece of the jigsaw to be put into place was the land to the rear of Hawthorn Grove down to the river, an area known as Black Butts, which was purchased by WUDC in the early 1930s. The severe economic conditions of that time and the need to pay off a loan for the 'old' Wilmslow bypass meant that little was done with the land. The approaching Silver Jubilee of King George V and Queen Mary in 1935 and the need for the council to show it was taking a lead in the celebrations prompted action, however, and after extensive fund raising and much hard work, 'The Carrs Extension' was formally opened in May 1935 as part of the Jubilee celebrations. A great deal of effort had gone into making the extension of 'The Boddington Playing Fields' and Jubilee celebrations a success and for the first time, thanks to a new bridge over the river at a cost then of approximately £100, the whole length of The Carrs from Chancel Lane to Twinnies Bridge was accessible for use by the public as a recreational facility. But what of the area north of the river running up from the river to Styal Road and Grange Park Avenue and adjoining the land given by Ernest Greg in 1932? It is unclear how, or precisely when, this land came into The Carrs but we do know that in the early 1960s the land was still being used for farming even though it was by then owned by the local council, presumably acquired as local farm land was sold off. By the late 1960s, however, the plans of the Council for adding this area to The Carrs were being acted upon and the final piece of the jigsaw that is the growth of The Carrs was put into place to give us the open, green area we enjoy today. Since the land was first acquired by Henry Boddington, it has seen significant physical changes with the wildness now tamed and the River Bollin running a much straighter course than the serpentine route of many years ago. Evidence of the former course is clearly visible between Chancel Lane and the first bridge. It is interesting to discover that the preparations for the Silver Jubilee celebrations included work to repair and strengthen the river banks that were being damaged and eroded - a problem that has not gone away! Most of the wild flowers have also disappeared, and aliens like Himalayan Balsam appeared; the bird life will have changed and the fish population all but disappeared but is now, pleasingly, recovering. From the first transfer of land by Henry Boddington, additional facilities have been provided including a children’s playground, a bowling green, tennis courts, etc, although proposals for an open air swimming pool (The Wilmslow Lido?) never came to fruition. Today as a 'green lung' for the town, The Carrs are even more important providing open space and recreational facilities for the residents of Wilmslow and well beyond. The forming of The Friends of The Carrs in 2004 also means that after a number of years of relative neglect the land is once again receiving some loving care and slowly being brought back to its former glory along with a much improved mix of plants and wildlife. There are, however, many matters still to be addressed, including the ongoing battle with river bank erosion, better visitor facilities, including toilet facilities, in the heavily used area near the Parish Hall, a possible multi-use path and the need to plant more trees now for future generations. Thanks are due to Ray Acton, in particular, as well as Paul Jabore and Terry Broadbent for their help in preparing this history of The Carrs. Do you have any information or memories regarding the growth and development of The Carrs? If so, please let us know by contacting the Friends of The Carrs at our website.